There are a lot of things that someone can be disillusioned with these days, but I refuse to let my birthday be one of them. Honestly, every year, I have the same group of five over, they choose things to give me from my internet wish lists, and then we watch a movie and I tell them what I’m going to do with the rest of the year, how this year will be different than last year, this is the year I will leave Point Cabrillo, I’ll leave the lighthouse, I’ll give most of my belongings away to charity, and I’ll finally use my savings to buy one of those pick up trucks with the one room apartment in the back. It’s funny, though – we may not have a lighthouse keeper anymore, but the computers that run the lighthouse certainly need maintenance, so instead of a lighthouse keeper, you have a lighthouse computer keeper, and they still pay me the lighthouse wage set forward in the city charter 100 years ago (adjusted for inflation). They still put me up in the house, and it’s hard to travel when you’re the only person that knows the programming code the lighthouse program was built on. The romance is mostly gone, though. I can have people over, which is probably the single most devastating thing to the lone lighthouse keeper image. I’m not the only person in the world, fighting a battle against the elements and the jagged rocks, grizzled with a flowing beard, wrapped in a yellow rain slicker, controlling the fate of ships so they don’t fall victim to the shoreline. I think the lighthouse keeper has given way to the air traffic controller, which is sadder, because you’re beckoning people towards you. It’s all much more lovey-dovey; I’m sure they have to keep their beards trimmed. That’s what I think about every year at my birthday. I start with myself and how I should finally get away from the coast and see the land of the free and then the other lands of the (presumably) depressed and opressed, but then I get to thinking about these five friends that come over year after year and the lighthouse, and then I think about training one of the fool kids that apply for the job that would probably remind me of a romanticized version of a young me, and then after I hire him for his go-get-’em attitude, he’ll sigh audibly any time I try to teach him something to take home and think on. I think about how I need to leave, and then I realize how hard it is for me to leave as the years go by. When everyone leaves after my birthday I take a piece of my cake and walk over to the cliffs that the lighthouse used to look over. Ships don’t really come by any more, or not with the frequency you would think would require a lighthouse. I make a big show of using Navy Morse Code if anybody does come by my vintage lantern I found in the basement of this place, if I’m there and the computer isn’t doing all the work keeping ships safe from the jagged edges of the rocks. I use my fingers to bite into the cake and wipe my hands on my pants after every bite, because, why not. When I’m finished with that slice, I go back inside and think about what it means to be a year older, still doing a job I took from a classified ad looking for a computer programmer back in the 70s. I haven’t even updated the system here. It’s still floppy disks. There are all sorts of weather warnings and interesting things the modern lighthouse can do, but any time I go down the coast and see one of these show-offy things, I just think back to Vegas and cheapness and I wonder if there is any dignity left in any profession any more, or if all of it is just money-grubbing and button pushing. There’s more cake, and I sit at the table to wolf it down, still without utensils. I’ve lost most of my romantic notions about lighthouse work. I know, for example, most boats these days are equipped with GPS and all of those bells and whistles, which is why I hardly ever see any boats around here anyway – no one navigates by the sight of the coast. People just want open water, blindly cutting their swath through the ocean, secure in the knowledge that their computer will supplement their knowledge. But: here’s what made 20-year-old me take that job, and what makes it so hard to leave even now, is that there is this idea that every now and then I’ve surely saved some poor saps’ life, and if not their life, at least their job. I’ve been a guiding light, a guardian angel of the coast. I may be sitting and letting the light be controlled by what is essentially a Commodore 64 with a more complex back up system, watching my gut grow and my beard get more knotty, as my brain gets weak with lack of difficulty, but there’s someone out there who felt the light fall onto their face, slicing through fog so thick you could drink it like a cloud smoothie, and felt saved from inevitable doom. That’s why I do it. That’s why anyone does anything, if you think about it. Just feeling that someone noticed what you did and felt better about themselves because of it. That’s why sewage workers do what they do, I’m sure. Same with those invisible curb painters that seem to come in the dead of night to refresh the red paint on a No Parking zone. I’m on that lower rung, something 99 percent of the population probably doesn’t even have to think about, and I don’t mind that. And, that cake’s gone. I shouldn’t have had it all. Posted on Sunday December 19th, 2010 Wednesday March 26th, 2014 by Max Elman. 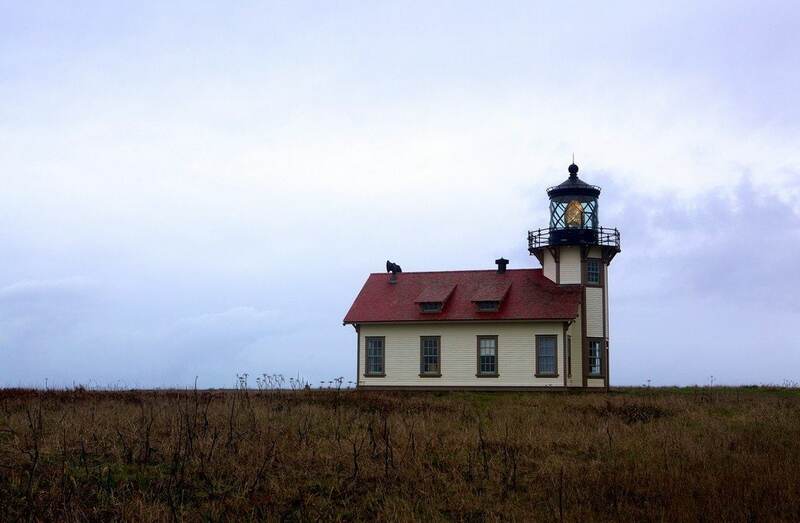 This entry was posted in Photos & Stories and tagged lighthouse, lonely, obsolete. Bookmark the permalink.